Some people just talk about it. 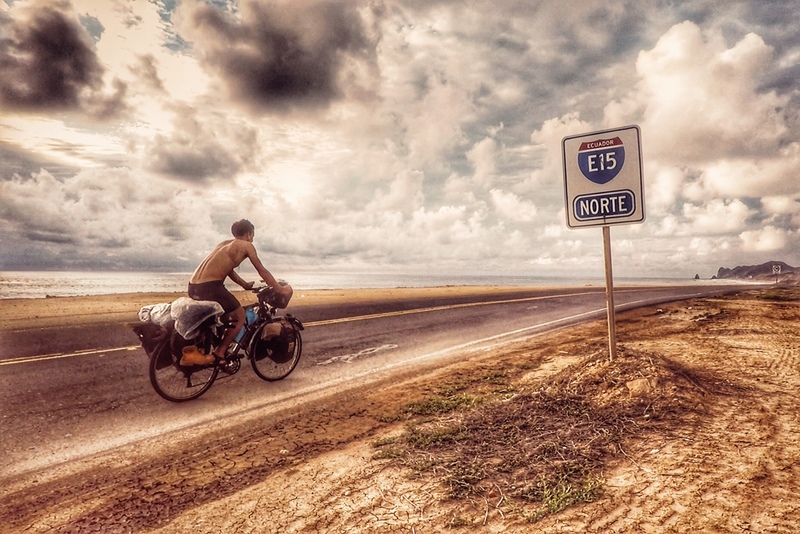 Matěj Balga from the Czech Republic mounted his bike three years ago and literally travelled around the world. He crossed Asia, got to North America, rode it down to Mexico, almost drowned in the Caribbean Sea, worked in Colombia, and now he’s digging his way through the dense jungles of Amazonia. Seems like nothing can stop him. The only reason he’s doing it? Pure love. What brought you to the decision to set off on the trip? There was a girl… a girl I thought I would marry one day. In February 2014, I got seriously ill and I guess we were too young to handle it together and a storm came into the paradise. End of August, I saw her off to a plane headed to South Korea and just like that, she was gone. She meant the world to me and I couldn’t cope with it so I bought a used bike with a blurry intention to get her back, to do something big and bold in order to show her how much I care. And then… even if that would not work, I believed that long nights alone, new places, and skies full of stars can heal almost any wound. Three weeks after that I was on the way. When reading your blog, I didn’t quite get if you kept the same bike all the time or you lost it and changed it for another? Can you describe it a little bit for us? And can you tell us what do you take with you? Yeah, Baghira is still tagging along, although the only original parts that have made it all the way are the Specialized aluminum frame and the (no-longer-working-suspension) fork for I completely refurbished the bike in Canada, so now it sports a pair of disc brakes, Brooks saddle, touring 36-spoke rims and the best of all: a hub dynamo that powers Busch&Miller light system with USB charger. Riding a lonesome coastal road on the way to Manta, headed to cross the equator for already the fourth time. Ecuador, January 2017. As far as the baggage is concerned, I have aluminum racks both on front and back, each of them carrying two panniers on the side, the front ones are for clothes (now just 8 pieces – two shirts, two T-shirts, pants, shorts, a pair of jeans for the cities, and a jacket) and food (I am mostly cooking on my little gasoline stove to make it as cheap as possible); in the back I pack stuff for camping (hammock, sleeping bag, and a sleeping mat) and The Ladybug, my packraft. Lately, I added also a violin on top of that, a very unnecessary yet pleasing thing to have, if you ask me. How many kilometres have you ridden so far? Do you still count them? It is less and less important, but most of the time I have my cycling computer counting that for me and right now the digits have stopped at 18 445 kilometres. Some people just cycle every day to some new destination but your journey looks more complex – what else did you do except pedalling? If we’d be talking about the means of transport, then, in Asia, usually due to weather or bureaucratic obstacles, I was forced to take a few trains, I hitch-hiked most of my way through Turkmenistan, took a plane across the Pacific, hike-biked to the Magic Bus in Alaska, drove a car from Whitehorse to Vancouver for a guy who wanted to fly instead, paddled the Caribbean Sea from Panama to Colombia, hiked a portion of Ecuador and lastly, I packrafted down the rivers in the Amazon rainforest trough Ecuador, Peru, and Colombia to Brazil. But it is fore-mostly an inward journey and as such I should not forget about my mental means of transport, which would include a fair share of mind-altering substances, female company, and good literature. How did you pay for your expenses? Have you always had sufficient sources for such a long period on the road? That sometimes remains a mystery to me too. When I started, I had 140€ and 51$ in cash and some emergency money to withdraw from my credit card if needed, but somehow I managed to keep going for almost three years. More or less, I am always on the brink of bankruptcy with no more than two hundred bucks in my pocket; several times I also ended up completely broke, worst of which was when I was homeless in San Francisco, but over time I gained some certainty in uncertainty – I know now that however horrible the situation might seem, the solution will always present itself at the right time and frankly, that is what makes it even more interesting and, in my eyes, more close to a true pilgrimage that I intended to undergo in the first place. I now usually travel for roughly four months and then stop in a big city, I get drunk, I meet people, make connections and, sooner or later, I stumble upon something, be it a paid job or just volunteering for some food and a bed. I harvested olives in Italy, I cooked and cleaned in Turkey, was a bartender in China, a software programmer in Canada, or a receptionist in a Colombian hostel. Also, I have to thank all the kind and generous people whose donations and support were a big part of what got me here. 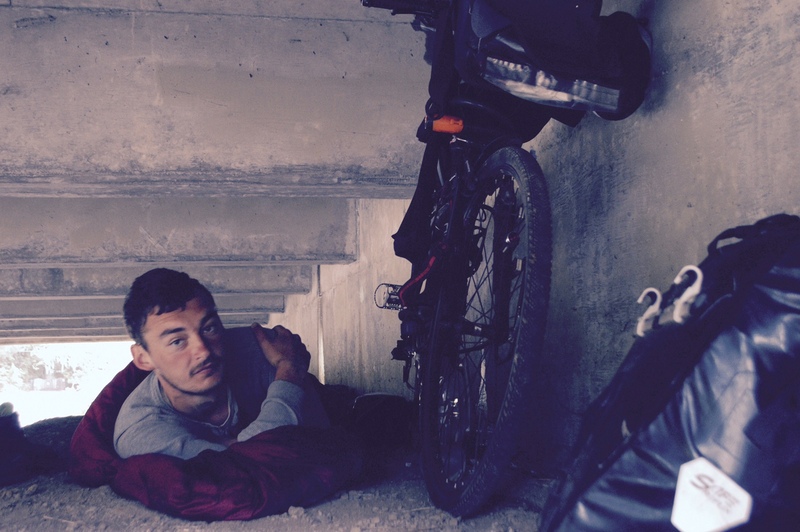 Do you have a personal advice to people who wish to have similar experience and travel around the world by bike? Don’t wait for the right moment, the time’s now; don’t wait for the money, there’s plenty of it all around the world; don’t worry about the gear, you don’t need anything special and you probably already have all you need. Be bold, improvise, set your priorities straight and you can leave next month. Everything else will solve itself on the road. As I know, you’re suffering from a serious disease. How much does it affect your life under way and how do you treat it actually? They told me I have Crohn’s disease, which is an IBD, a chronic inflammation in your bowel that weakens its walls, leaves scars there, and can lead to impassability of it. Simply put, there was half a year of diarrhoea and a lot of blood when I started, but it got a lot better in Italy and even more so when I pedalled further and really hard. Because to get it under control, they usually give you some form of steroid hormones, so my theory is I am just battling it by producing them naturally. I should be taking some immunosuppressives as well, but those are long gone and hard to get on the road. Anyway, I don’t have any health insurance, so I am just taking my chances here and there and hope to continue feeling fine as I had last couple of months. Out of sight, out of mind. How often do you feel sad and alone? What do you miss foremost? I sometimes miss my old life. We were going to college, we were in love, beer was cheap and everything was easy. I miss not having to run all the time – since then, it is like walking barefoot on a hot sand – the beach is beautiful, but you can’t stay in one place very long or else it starts to burn. Yeah, I get melancholic at times, luckily, it makes me write better, at least. At any rate, I look forward now, because Memory Lane can be a marvellous getaway but you really shouldn’t make your home there. 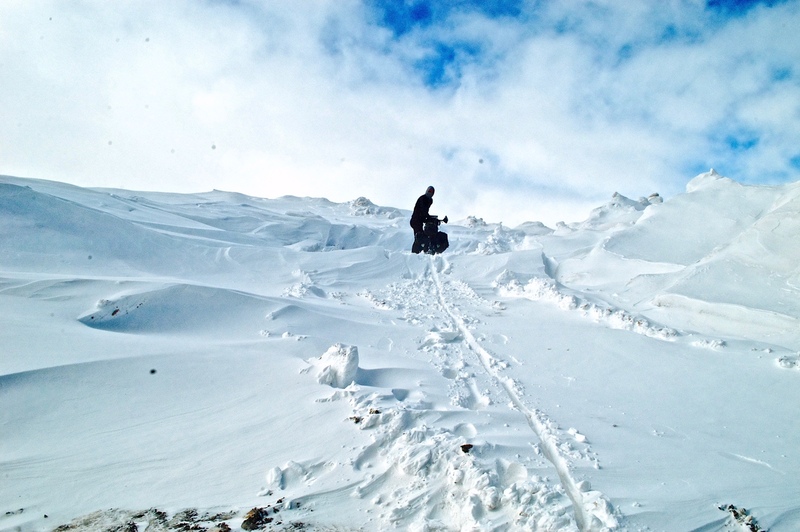 Pushing his bike through the snows of Tonmurun Pass after blizzard. Kyrgyzstan, Spring 2015. Which parts of your journey were the most dangerous? Well, I almost froze to death in Pamir mountain range in Kyrgyzstan, ran out of water in the midst of the Taklamakan Desert in China, and fell into an ice-cold river in Alaska, but the hardest thing of them all was paddling the Caribbean Sea. Like if the hard sun, mosquitoes, big waves, and lack of drinking water were not enough, one day my packraft flipped upside down with me during a storm and that’s when I lost it for the first time. I saw most of my stuff sinking, all my videos were gone, my feet were severely cut by a coral and the land was eight kilometres away. I watched myself scream in panic like a little boy. What did you lose and what did you find during your trip? I’d say I might have found a way but I’ve lost the direction. Do you remember some real friendships or love affairs gained along the way? There are several people who I still keep in contact with, some of them I even met again in different corners of the world, but I guess one of the most important lessons of traveling is to learn how to let go. In a short time, you can get incredibly close to someone only to part ways a week later, so you just need to appreciate the special moments today because tomorrow they will be gone and you might never see them again and if you could not let go, you would soon cry your eyes out. Do you still feel the hunger to discover new countries or are you slowly pondering about going back home? It was never about countries or sights. It was just about going further, conquering the vast distances of the East and, hopefully, reinventing myself in the process. And as if there would be this unlucky, dismal symbolism in turning around and going Back, I carried on and on and look: now I am just five time zones from the one that I started in, so I figured I will just try to close the circle now. I’m really just wandering around with not much more than a few misty plans, trying to survive and tear my own bite out of the world. Being brutally honest now, what keeps me going is of lately not the urge to discover more, but a growing fear of going back. Those were some steaming, hot, and humid days on the Napo River! Matej even forgot about his precautions concerning malaria and could not help it but ride just in his swimming shorts. 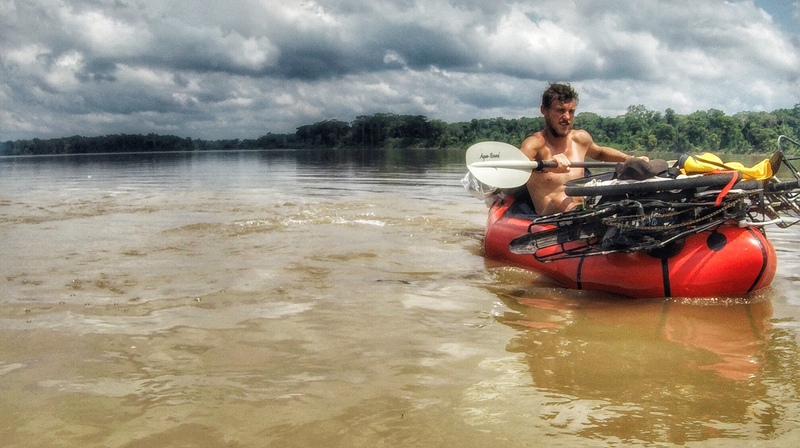 To ride the lower stretch of the river from Coca, Ecuador, to Iquitos in Peru, packrafting with the bike on top, has taken him exactly twenty-one days just like the one in the picture. “One of the best adventures of my life!” Matej says. Peru, February 2017. What was the longest distance you made by bike in one single day? Finally, an easy one! 241 km across Taklamakan Desert in XinJiang province of China. Do you feel like a stronger cyclist, after all of this? Would you dare to take part in some cycling race after you return to the Czech Republic? If you’ve asked me just after I got to east China, I would have said yes without a doubt, but now I am not so sure; I cycled more than 12k the first year, 4k the second one, and in the last year I am pretty sure I paddled more than pedalled. Let’s see when I get back. Do you keep track of how many countries have you visited? Now it is a beautiful number of 50 in total and 32 on this particular trip, but I am not much of a country-counter-type, though. You travel 1000 km in Europe and you can tick a dozen of your list, while this distance means nothing in China or Canada. Or vice-versa: you fly to St. Petersburg and you tick off all this amazing vastness of Russia as “visited”. That doesn’t do it justice! I try to see world as a whole and fill my blank spots regardless of the restraining concept of borders. How do you navigate through the foreign countries? I love my good ol’ fashioned paper map and that’s how I crossed Asia, however, now I have that USB charger and a better phone, so I got spoiled and I use maps.me and GPS when in doubt. What would I give for that when I was in China or Iran and rode pretty much just in the direction where the sun was rising! Really – I had a map of China, but not very detailed and at any rate, it had all the names on it in Latin characters, which was not the case with the road signs. The only sign I understood at the time was dóng – East. So every time I saw it, I just blindly followed, sometimes not sure for days which road I was on. One fewer item on his bucket list! Admiring Northern Lights (or Aurora Borealis, if you wish). 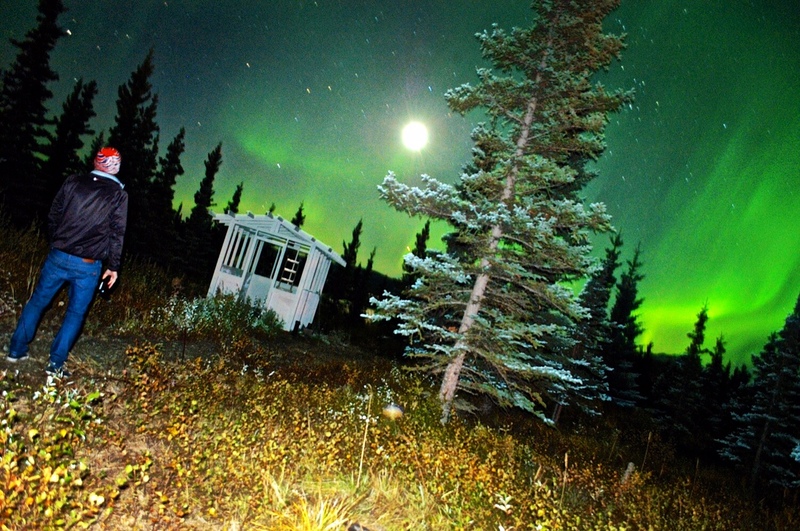 Alaska, Fall 2015. What was the greatest surprise about the national stereotypes and traditions concerning hospitality or helpfulness? That would be the United States, I guess. Maybe it was bad luck, but it was the only country where nobody would just casually invite me for lunch or offer accommodation. Not that I would be seeking that, but in every country there was someone to do that, just because they wanted to. Apart from that, I would say that Iranians are not religious fanatics and Colombia is not guerrillas and drug lords but on the other hand most of the Chinese really are farting, burping and spitting at the table and Italians really do have the best cuisine and drive like crazy. So there is some truth in all stereotypes, be it good or bad. Is there some way our readers could support you? Well, first of all I would like to encourage everybody interested to read my blog and then and only then, if they still like it, they will find a way how to help me. Also you can like me on Facebook and/or follow me on Instagram, because mental support counts as well. In the beginning of your blog, that search for your love was the main reason you decided to go into the world. How do you feel about this decision today? Have you found “the love” already? …the further I went, the more abstract that word had become. About love, I feel like a barren desert with nothing but stones there. But when you pick one of them up, underneath it there is a whole lotta life, a whole army of bugs of thoughts about Her that eat everything else that would have the courage to grow there. Over time, I realized that I might still love her and that this journey won’t end until I come back to the start, meet her and let us confront ourselves with the time passed. Until then, I have learned to live with it as I did with my illness.